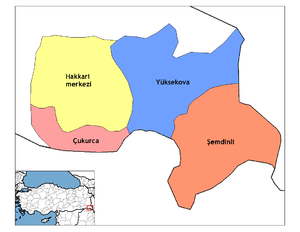 Hakkâri Province (Turkish: Hakkâri ili), is a province in the south east corner of Turkey. The administrative centre is located in the city of Hakkâri (Kurdish: Colemêrg‎). The province covers an area of 7,121 km² and has a population of 251,302 (2010 est). The province had a population of 236,581 in 2000. The province was created in 1936 out of part of Van Province. Its adjacent provinces are Şırnak to the west and Van to the north. The majority of the province's population is Kurdish.